Yes, my little girl is now 8 years old. Unbelievable is all I can say! Happy Chinese New Year...a little late! Emma got her braces and palate expander taken off today. She's had the palate expander for about 8 months and braces for just three months. But the orthodondist says we have to let more of her permanent teeth come in and then decide if any other orthodontia is necessary. In the meantime, she'll have to wear a retainer at night, which should be great fun for her. I have to say, her front teeth look great...very straight and no big gap or anything (as you can see in this photo of her serenading her toothbrush! Emma and her good friend Jenna are both in the midst of Pokemon-mania. Whenever they get together, they huddle over their Pokemon cards and books and speak what sounds like a foreign language to those of us who are clueless about Pokemon. Jenna's 8th birthday is this weekend, and when her mom asked her what she wanted to do for her birthday, she said she just wanted Emma to come over and play Pokemon. So that's what we did today. After a nice lunch at Pei Wei with Jenna and Kay (Jenna's mom) I dropped Emma off at Jenna's house for a couple of hours and the girls played with their Pokemon cards, watched a Pokemon movie and read their Pokemon books. The two had a wonderful time! ...we had such a wonderful Christmas. For the first time in like 25 years, our entire family was able to spend the holiday together. It has been so great to hang out with my parents, siblings and their families the past few days. Emma has had so much fun playing with her cousins. We were blessed in the gift department as well...I finally got a Kindle (yea!) and Emma got a Wii, a camera and a scooter, among other things. But I think her favorite gift was the Pillow Pet she got from her grandma and grandpa...she has barely put "Bubbles the Hippo" down since she unwrapped him! Hope everyone had a wonderful holiday as well! ...I met my daughter for the first time in China. Has it really been that long? I am so priviledged to be this little girl's mommy...she has been the light of my life for every day of the past seven years! Emma is getting to the age where doubt begins to creep in about the authenticity of Santa Claus. We were in the car the other day, and she asked me if Santa is real. I asked her what she thought, and she said she thought he was. But I'm sure many of her friends no longer believe. Anyway, she still really wanted to go to the mall to see Santa, so we headed there the other day. While we were standing in line, she kept rehearsing her Christmas list so she would get it right when she saw Santa. He was a great Santa and Emma was so happy afterwards. Hope this isn't our last year for this tradition! Emma got braces today! Okay, they are only on her front teeth...to help pull them down a little. But still kind of a big deal. So far, they aren't bothering her a bit - but the orthodontist said they could ache a little tomorrow. Right now, she's just excited about showing them to all her friends at Brownies tonight! 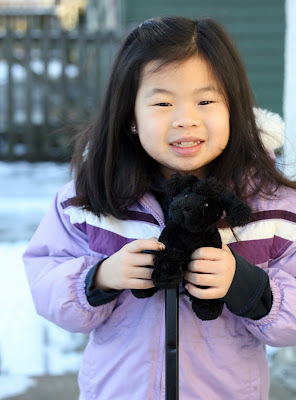 I'm a single mom to Emma, adopted from China in December 2002. I love my job as an editor.